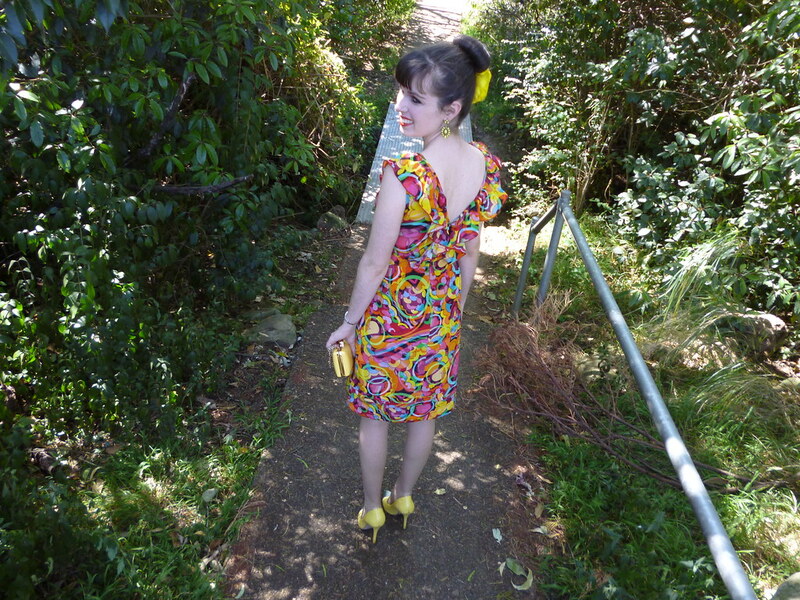 This is definitely my all time favourite outfit; I dreamed of owning a rainbow dress for so many years and it was a miracle when I actually found one! The colour scheme and geometric print reminds me of the 1960s. This dress has always reminded me of my friend Alyssa from Butterflies on Mars. I love the fun and happy vibe to this dress, I adore the ruffle detailing and the silk crepe de chine material makes it so comfortable for summer. I also like how the shape is different from my usual fit and flare dresses; it inspires me to wear straight slim lined dresses more often. The possibilities for styling are endless – to think that I could emphasise any one of the myriad of colours present in this dress is rather exciting. Next time I want to style this dress with blue accessories such as my Ruche heels which I posted here. I undoubtedly thought yellow accessories would be the most striking and I absolutely adore yellow these days (despite having a love-hate relationship with it for so many years). These yellow heels that my sister bought me last Christmas have been one of the most amazing, popular and most utilised pieces I’ve ever owned. I love them so much and these shoes have the ability to add so much to any outfit. I was lucky to find the yellow clutch in the shops (I always find it so difficult to acquire yellow bags) and it was the last one left. I wore this outfit to a 21st birthday party on Saturday night. I can’t wait until I wear it again. It’s a long weekend here which I greatly appreciate; given the early hours of my job I need to catch up on sleep. As I’m sure you all know I left my last job which was absolutely heartbreaking at the time but as it turns out you were all right – there was something better just around the corner for me. I truly can’t believe it because I never possibly thought another job could take the place of my last one. I am satisfied with my current job and there are a myriad of benefits with my last job did not possess. Life sure is random – the way the situation cut me so deeply at the time but was overall positive in the long run. I’ve been at my new job for a week and a half. It is a legal job and therefore more relevant to what I studied at university. It’s also a much healthier environment in terms of work life balance; I’m no longer completely married to my job an the workplace is more relaxed. The only downside is that it’s a contract job and very much tied to the current political environment so I know it’s not forever. 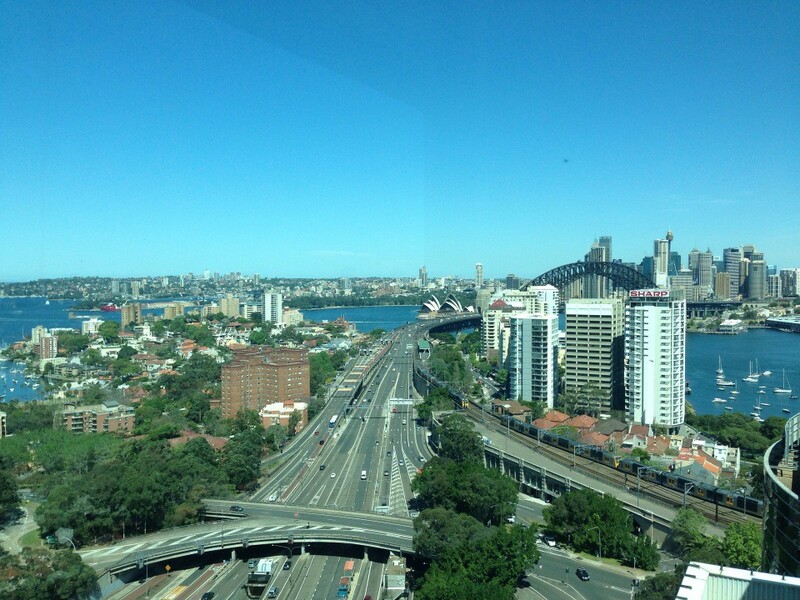 I’ll definitely enjoy it for the time being and make the most of the opportunity .Thank you for your support and kind words which, in the end, proved to be true…the views from my new office aren’t too bad either! See above. 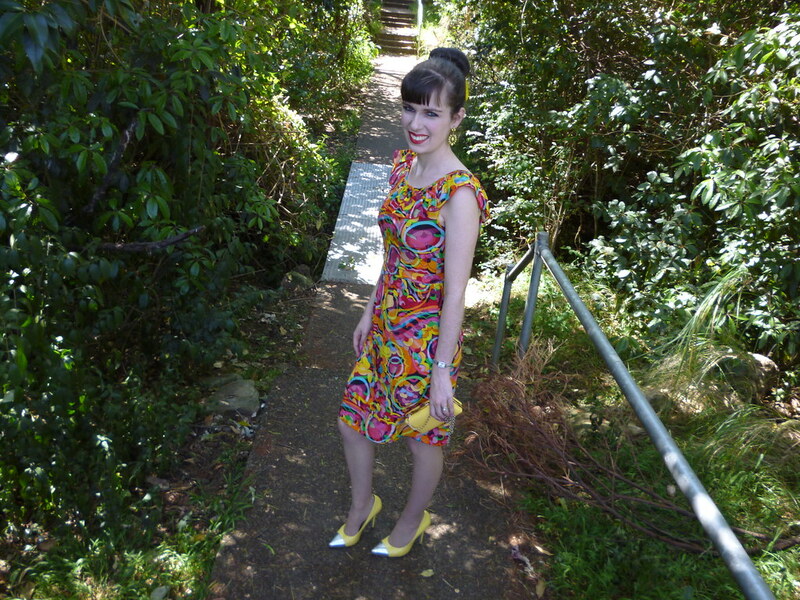 This entry was posted in Alannah Hill, Colette, Outfits. Bookmark the permalink. Wow! that dress is absolutely spectacular! I love this print so bright and you look really radiant in it!! I'm glad that you begin a new stage in a job that you are happy now. That's great, I wish you all the luck and good vibes from my heart. Happy week, dear Imogen. Such a lovely dress and the print is beautiful of course you look beautiful!!!! The dress is beautiful and it would go with any color of accessories! I love it with the yellow shoes and purse, but it would sure look amazing also with the blue you mentioned. Also, happy you like your current job! wowww you look stunning!! !I love this colorful dress, and those yellow shoes are amazing! I really like the retro inspired dress! Nicely accessorised! I love the colors of your dress! Stunning dress!!! It suits you perfectly well. Oh how I so love the colors too. You did an awesome job with the styling too. The print and colors in your dress are so pretty. Fabulous yellow accessories. This whole outfit is just perfection. You look adorable! stunning print! you look stunnng! Dear Imogen, it's so wonderful to hear that you have found a new job, such a massive boost for your self esteem and confidence, I just couldn't be happier for you, congratulations! Lots of people have commented that you are radiating happiness in this (spectacular!) 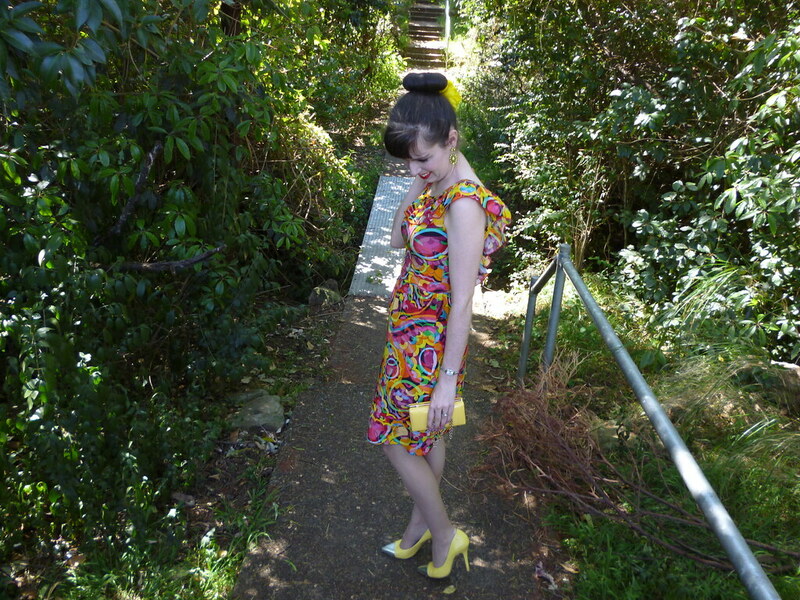 dress and it's absolutely true, such a joyful post, thank you lovely rainbow girl! What a wonderful outfit, so wonder it's your favorite. You look great! oh so lovely this dress! Gorgeous dress! It is so exciting to hear that everything worked out so well with your new job! Sometimes the best thing is right around the corner! that dress is so pretty. I love how vibrant it is! What an amazing dress ~ love the print and the v back… You look so gorgeous! I love the colors and pattern to this dress! Your shoes are my favorite, super cute! Gorgeous! Loving all the bright colours. Your dress looks so much fun! The style suits you indeed! Not a bad view indeed! Congrats on your new job. I hope it stays longer than you expect. 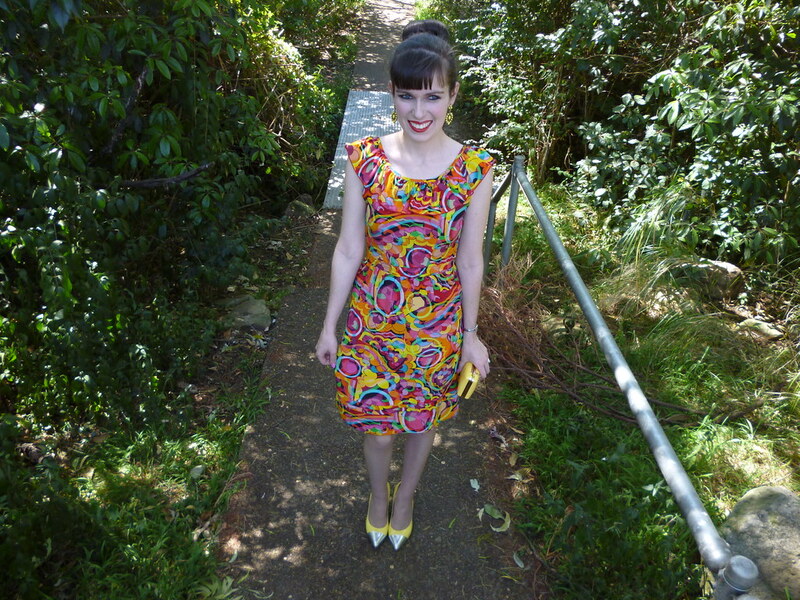 this dress is stunning on you and the yellow accessories are perfect with it! That dress is so stunning on you! I love the colors and print and it does totally remind me of Alyssa :-). You look gorgeous! So bright, so many colours, so stunning! Love this look a lot dear, it's gorgeous! Suits you well. You look stunning in that colourful outfit – it suits you so well! That dress is amazing! You look beautiful. So glad your job is working out for you.